The joy of making mask has been a cultural practice for humanity since the time of animism. The tradition of Cherial Art form began with scroll painting. Cherial Scroll Painting is a stylized version of Nakashi art, rich in the local motifs peculiar to Telangana. Like most other traditional painting forms this was used for story telling. Particularly the smaller intricate stories from the epics would be illustrated in the Cherial scrolls. 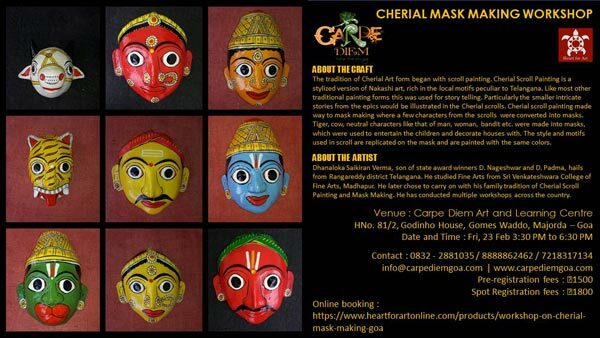 Cherial scroll painting made way to mask making where a few characters from the scrolls were converted into masks. Tiger, cow, neutral characters like that of man, woman, bandit etc. were made into masks, which were used to entertain the children and decorate houses with. The style and motifs used in the scroll are replicated on the mask and are painted with the same colors.